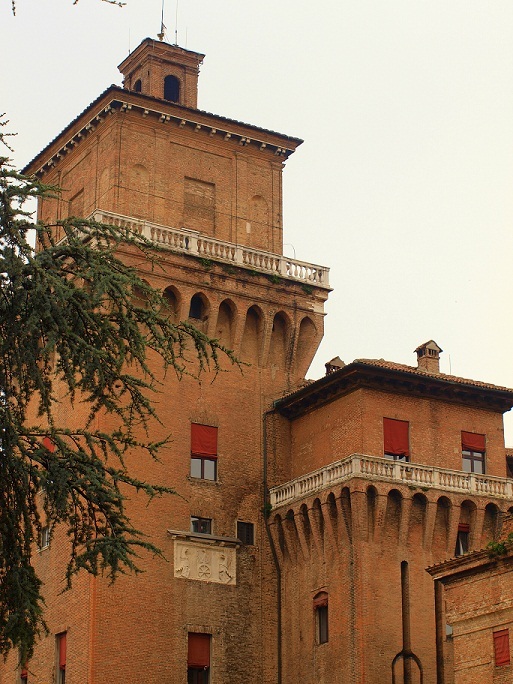 About an hour on the train from Florence (after a change at Bologna), in the Emilia-Romagna is Ferrara, where the rather magnificent Castello Estense was home to the Dukes of Este. The Este family rose to power in the late medieval period, building and expanding the castello over the centuries. Right in the centre of the town, the building, and moat, remain well preserved although the interior is rather Spartan, especially compared to somewhere like Florence’s Palazzo Vecchio. Still, the curators have done an impressive job with what little they have. There’s little furniture or wall decoration remaining but the ceilings are beautifully decorated and some rooms’ only floor furnishings are giant sloping mirrors so one can look at the ceilings without craning the neck. There’s also a lovely veranda with orange trees which feels almost Moorish in the bright sunshine: a stark contrast to the damp subterranean dungeons, used to imprison enemies of the Este family through to the sixteenth century. It is in Ferrara, in the Castello Estense, that Lucrezia Borgia spent the second half of her life as the wife of Alfonso d’Este. She arrived in 1502 with two previous marriages behind her. She never returned to Rome and the nefarious influence of her father and brother. She flourished in Ferrara and although he had been reluctant to marry the notorious Pope’s daughter, Alfonso grew to love Lucrezia and despite numerous infidelities on both sides, their bond seems to have been strong and affectionate. They had six children, of whom four survived into adulthood. 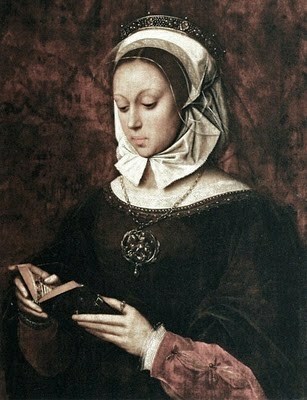 Her sister-in-law, Isabella d’Este (1474-1539) never fell under the spell of the charming Lucrezia though and maintained a bitter hostility to her. No doubt fuelled by Lucrezia’s passionate affair with Isabella’s husband, Francesco Gonzaga. Another point on the Lucrezia Borgia map of Ferrara is the little church, attached to the convent of Poor Clares, of Corpus Domini a short walk to the south. It’s hidden away from the hubbub of the town centre where bicycles trundle about in all directs. There’s little in the way of signs outside it: just a small plague erected in 2002, Ferrara’s Year of Lucrezia Borgia, which notes that inside is the Este tomb and Lucrezia’s grave. The church is open to the public for two hours in the morning and another two after lunch. A door to the right of the altar leads through to the nuns’ choir where Lucrezia and other members of the Este family are buried, including one of Lucrezia’s daughters, Eleanor (1515-1575), who was a nun at Corpus Domini. 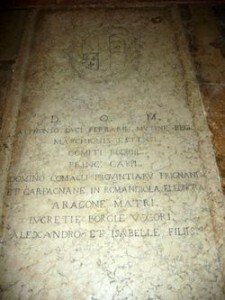 Lucrezia is buried with her son Ercole, her husband, his mother, and the infant daughter, Isabella, Lucrezia died giving birth to. This entry was posted in Infamous Women, Lucrezia Borgia, Photos, Travels and tagged convents, Ferrara, graves, history, Isabella d'Este, Italy, Lucrezia Borgia, mistresses, travels on May 7, 2011 by Gillian. 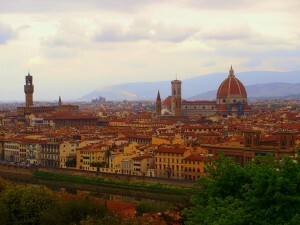 Florence is packed with history. 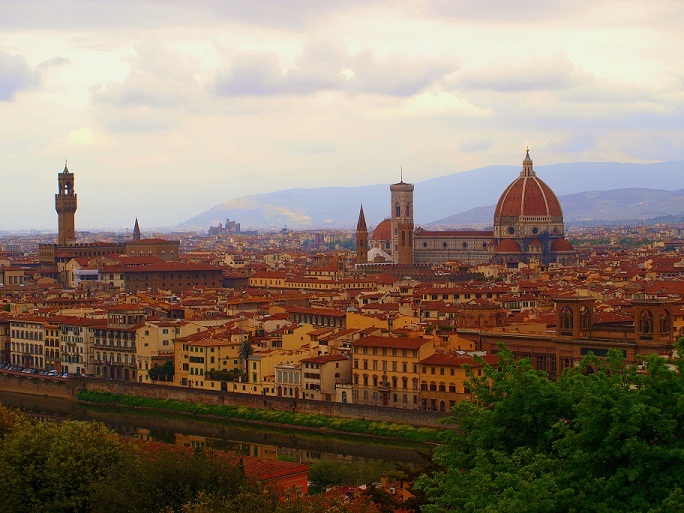 There are relics of the Medici and other great dynasties everywhere (though very little relating to the city’s daughter who went on to be queen of France, Catherine de’ Medici). As we were there over Easter, we went to the Duomo on Easter Sunday to watch the scoppio del carro (explosion of the cart) which is a practice peculiar to Florence, dating back nearly a thousand years to the Crusades when 3 flints from the Holy Sepulchre in Jerusalem were brought back to the city. The flints were originally kept by the important Pazzi family. Traditionally all the fires (hearths, lamps, candles) were extinguished on Good Friday and a new fire started on Easter Sunday, marking the death and rebirth of Christ. The flints were used to create the spark for the new fire which was distributed to local households, for them to rekindle their own hearths, on a cart. 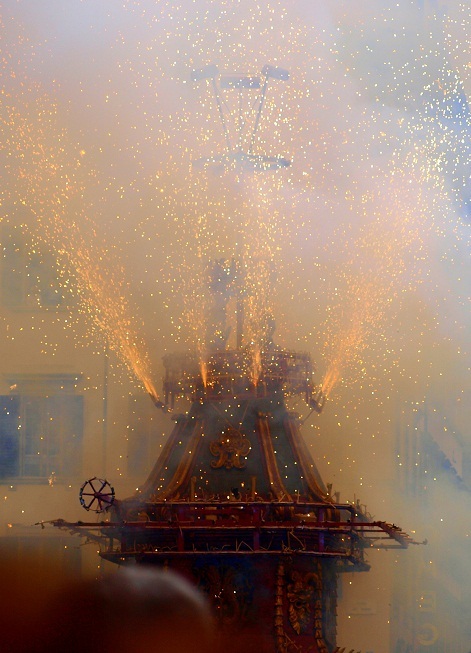 Over the centuries, the ritual became more elaborate and fireworks were attached to the cart to make more of a spectacle for the most important Christian festival. 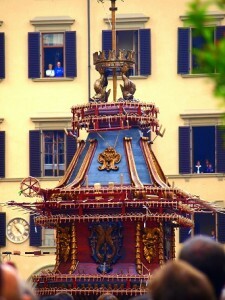 The cart is taken through the streets to the area between the Duomo and the Baptistry (Florence’s oldest building) where the fireworks are ignited. The explosions last for around twenty minutes, in broad daylight. 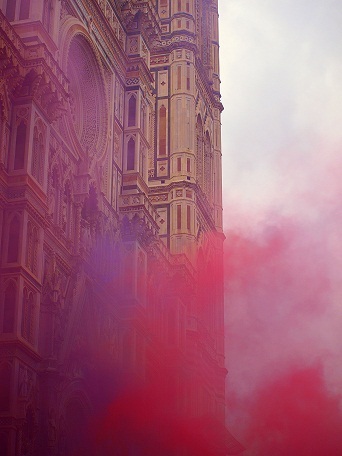 It’s loud; there’s a lot of coloured smoke and (if you can see it through the crowds) it’s a pretty amazing sight. My photos aren’t especially good- I’m not tall enough to see over the heads of the crowd! Hopefully they’ll give you an idea though. 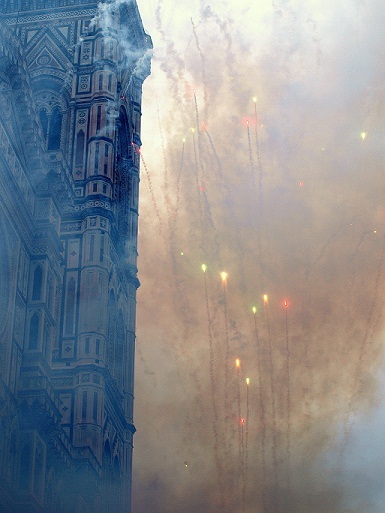 This entry was posted in Catherine de Medicis, Photos, Travels and tagged Catherine de' Medici, fireworks, Florence, Italy, medicis, travels on April 30, 2011 by Gillian. Keep up to date with history's infamous women!